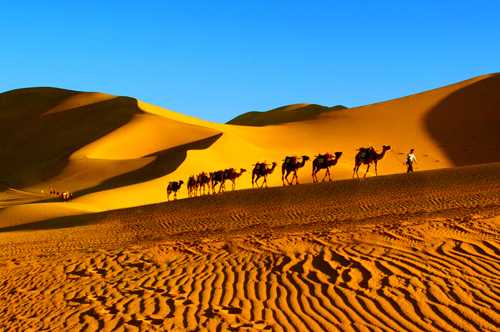 The Badain Jaran Desert is a desert in China which spans the provinces of Gansu, Ningxia and Inner Mongolia. 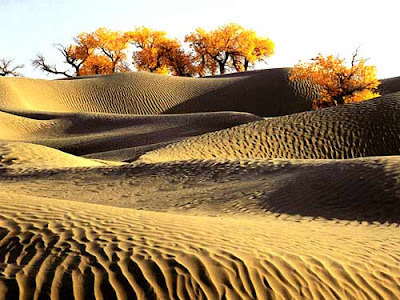 Covering an area of 49,000 ㎡, it is the third largest desert in China by size. At the altitude between 1200-1700 m, the desert has the tallest sand hill at over 500 meters, so it is also called the “Qomolangma of Deserts”. There are numerous moon-shaped and pyramid-shaped sand dunes and all kinds of sand hills with an average height of over 200 meters. 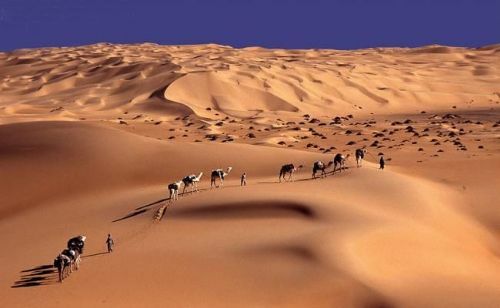 Badain Jaran Desert is famous for its five most fabulous scenes. They are abrupt rare peaks, singing sand dunes, lakes, magical springs, and temples. The Taklamakan Desert, also known as Taklimakan and Teklimakan, is a desert in the southwest portion of the Xinjiang Uyghur Autonomous Region. It is bounded by the Kunlun Mountains to the south, the desert Pamir Mountains and Tian Shan to the west and north, and the Gobi Desert to the east. As China’s largest desert and the world’s second largest desert, as well as the world's second largest mobile desert, Taklimakan Desert is one of the most mysterious and intriguing deserts in the world. Gurbantunggut Desert is located in the center of Junggar Basin, and the east of the Manas River and south of the Ulungur River. It is China’s second largest desert, also China’s largest fixed and semi-fixed desert, covering approximately 50,000 square kilometers, 300 to 600 meters above sea level. There is plenty of snow in the desert in winter, when in the spring time (after snowmelt), the unique desert ephemeral plants in Gurbantonggut Desert quickly germinate and blossom, making beautiful and poetic scenery in the desert. Singing sand is sand that produces sounds of either high or low frequency under pressure. The sound emission is usually caused by wind passing over dunes or by walking on the sand. It is strange but common natural phenomena in the world. 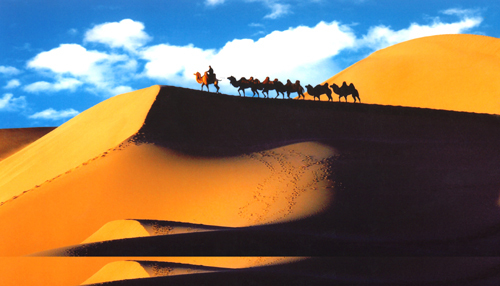 People usually refer the Singing Sand Dunes to the Singing Sand Dunes in Gansu Dunhuang Mingsha, but another Mulei Singing Sand Dunes in Xinjiang is also famous. 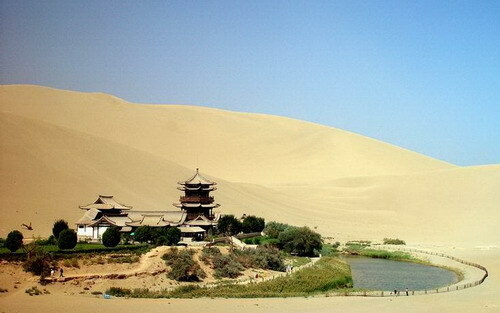 The Crescent Lake is a crescent-shaped lake in an oasis, 6 km south of the city of Dunhuang in Gansu Province. Crescent Lake is 100 meters long and 25 meters wide, the deepest is about 5 meters, its shape like a crescent, hence the name, it is also known as the “Desert’s first spring”. Since time immemorial, the scenic spot is famous across the whole world for its “Coexistence of mountain and spring, sand and water”. It is appraised as “Unique Scenery in the north of Great Wall”, and listed as National Key Tourist Attractions of the People's Republic of China in 1994. About over 300 meters long and 50 meters wide, the Crescent Moon Spring is surrounded by Singing Sand Dunes. The poplars stand elegantly beside the spring and fishes swim happily and leisurely. The spring water tastes fresh and sweet and water in the color of light blue. Shapotou is located on the southern edge of the Tengger Desert. It is the site of the world-renowned Shapotou Desert Experimental Research Station. There is also singing sand in Shapotou. Thousands of domestic tourists descend upon Shapotou each year to enjoy the natural scenery and partake in various activities on and around the 100-metre high dunes. It has a width of 2,000 meters and a height of 100 meters with an inclination of 60 degrees. When standing at the foot of the sand hills, you can see what looks like a waterfall, but is actually sand.